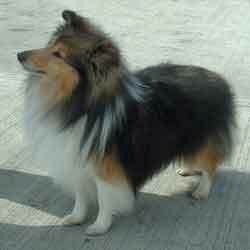 The Shetland Sheepdog (or Sheltie) is a small sheep dog bred for the terrain of the Shetland Islands. They look like a minature long hair Collie. Shelties have a double coat consisting of long rough guard hairs covering a dense fluffy undercoat and a lion like mane. Several coat colors exist: sable, blue merle and black with various amounts of white and/or tan. The best known color is the sable, which is dominant over other colors. The Shetland Sheepdog is an outstanding companion dog with a wonderful temperament. It is lively, intelligent, trainable, and willing to please and obey. Shelties are loving, loyal, and affectionate. Although they are excellent family pets, Shelties do especially well with children if they are raised with them from an early age. The herding instinct is still strong in many Shelties. They love to chase things, including cars. They do best with a sensitive, yet firm, owner. 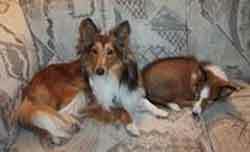 The Sheltie is, above all, an extremely intelligent and willing herder and likes to be kept busy. A small dog, the males weigh 14 to 18 pounds and are 13-15 inches at the withers. The slightly smaller females weigh 12 to 16 pounds and stand 12-14 inches.